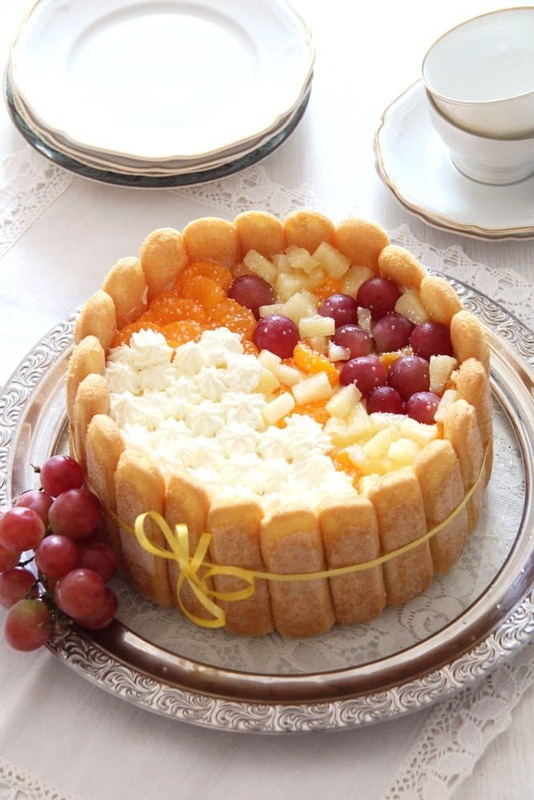 Charlotte cake or dessert – Romanian Diplomat Torte – with homemade custard, whipped cream, ladyfingers and lots of fruit. The Diplomat Torte is one of the most famous cakes in Romania. 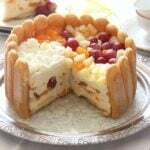 Made after the art of a traditional Charlotte russe, this cake or dessert consists of a lining of lady fingers filled with an amazingly luscious, creamy custard mixed with whipped cream and topped with lots of fruit, either seasonal fresh fruit or any canned fruit variety. The Charlotte cake, dessert or trifle has a very long history. Apparently at its very beginnings, the charlotte or charlet used to be a savory meat pudding eaten by the monks during the fifteen century in England. Later on a sweet version of the charlet was created, which consisted of layers of custard – charlyt, stale bread and fruit. However, this dessert became really popular after being recreated by the famous nineteen century French cook Marie-Antoine Carême, the so-called “king of the cooks, cook of the kings”, who cooked for King George IV, Tsar Alexander I and Emperor Franz I of Austria. 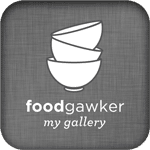 He created a cake or dessert filled with Crème Bavaroise, which is a filling made with eggs and milk, stabilized with gelatin and mixed with whipped cream. He named the dessert Charlotte russe in honor of Tsar Alexander I. There are endless versions of a Charlotte russe recipe out there. 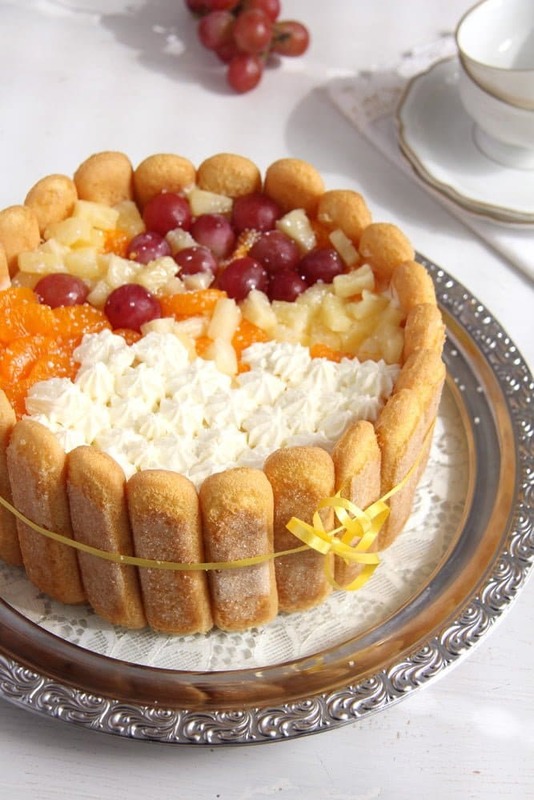 The Romanian version, called Tort Diplomat is traditionally filled and topped with candied, dried or canned fruit. I didn’t use any candied or dried fruit for today’s version (my son doesn’t like candied fruit much and my daughter doesn’t like raisins), but I did go for a mixture of canned fruit like pineapple and mandarins and fresh fruit – grapes. You could use any kind of canned fruit you like and almost any kind of fresh fruit as well. I saw many people using kiwi, but although I like kiwi, I did not have the courage to use fresh kiwi in combination with gelatin. Kiwi contains an protein-digesting enzyme that destroys gelatin, so I preferred not to put any kiwi in the cake. However, I assume you can’t go wrong if you place the kiwi only on top of the cake and don’t actually mix it with the custard. Strawberries, like in this wonderful Strawberry Charlotte, or any kind of berries are also a great alternative to the fruits I used. 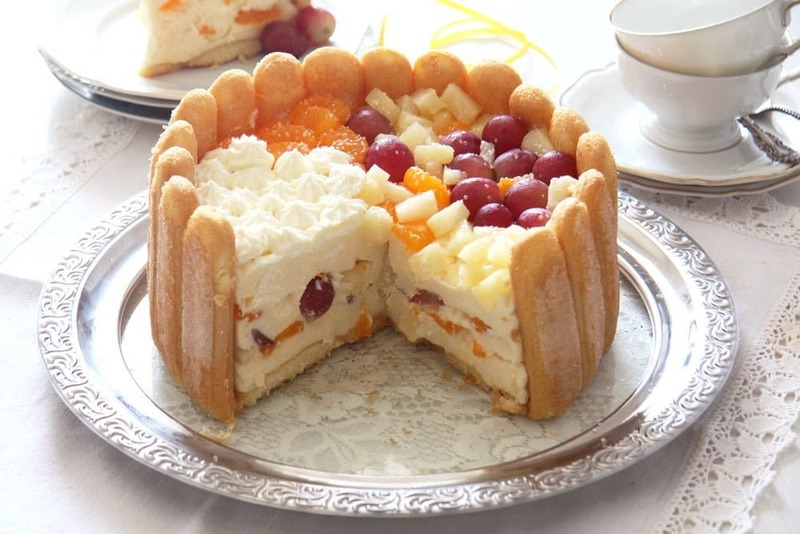 But, like I’ve said, for a really genuine Romanian Diplomat Torte, candied fruit and exotic canned fruit are the desired option. Drain the pineapple can and save the syrup. Give the syrup to a wider bowl. Or you could drain the mandarins first and use their syrup instead, whichever you prefer. Dip each ladyfinger in the syrup, very shortly, they should barely get wet and not get soaked. Arrange the ladyfingers, standing and with the sugared side facing the outside of the form, inside the ring of a 24-26 cm/ 9.5-10.2 inch spring form. After lining the spring form with the biscuits, arrange some of them on the bottom of the spring form as well. Break 1 or 2 ladyfingers and fit the pieces in the gaps, the whole base of the pan should be covered with ladyfingers. Chop the pineapple rings (or use already chopped pineapple). Drain the mandarins as well very thoroughly. Give the 5 egg yolks to a small pan. Add the sugar, corn starch and vanilla essence. Whisk well until smooth. Slowly start adding the milk while whisking all the time. Turn on the heat and heat the mixture while whisking continuously until it comes to a boil, it will take about 10 minutes. Let bubble once or twice until slightly thickened. Set the custard aside for 10 minutes. In the meantime soak the gelatin granules according to the packet's instructions. In case of Dr. Oetker gelatin granules soak them in 10 tablespoons cold water for 10 minutes. Add the bloomed gelatine to the warm custard and whisk well to incorporate. Transfer the mixture to a large bowl. Place a piece of cling film on top (it will prevent the custard from getting a “skin”) and let it come to room temperature. It will take about an hour, don't let it stand longer than necessary or the custard will set and the finished Charlotte will get clumpy after adding the whipped cream. When the custard has reached room temperature, whisk the heavy cream until stiff. Set 3-4 tablespoons of the whipped cream aside for the decoration of the cake. Fold the rest of the whipped cream gradually and carefully into the custard. 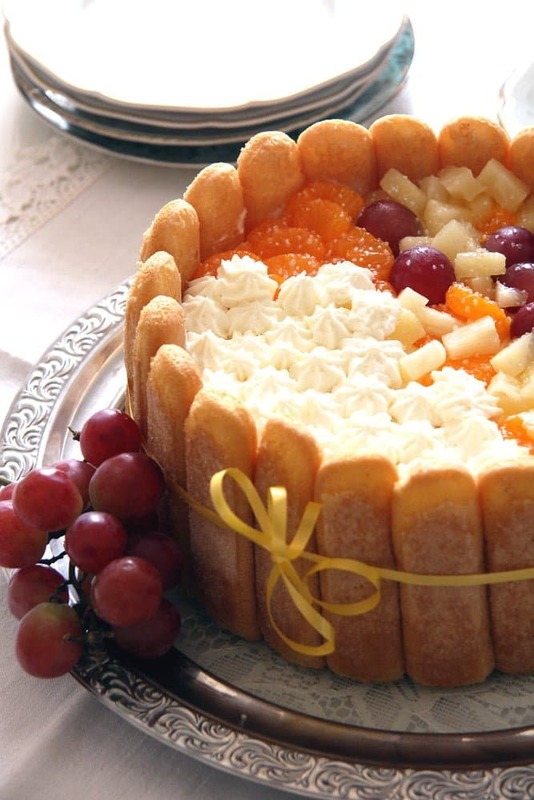 Set some of the pineapple pieces, mandarins and grapes aside for the decoration of the cake. Fold the rest of the fruit into the custard-cream mixture. Pour the filling into the prepared pan and arrange the remaining fruit on top. Pipe the remaining whipped cream on top of the cake as well. Place the cake in the fridge and let it get set overnight. Gorgeous! Love this stunning cake and all the history behind it, Adina. Wish I could say I am in the garden with a piece of cake in front of me, ha ha, but it’s been the craziest summer of my life. With two moves and our trip to Romania, I’m hoping fall will be a little quieter. What a lovely little dessert! This would be quite impressive to serve to guests…or perhaps royalty! Another stunning dessert, Adina, and I love the history behind it. I showed the picture to my daughter and she “Oh-ed” and “Ahh-ed” then asked me to make one for her birthday! Thanks for sharing another beautiful recipe. very elegant, and delicious to boot! Well, this definitely does look like a cake that if fit for a king! What a beauty! I’m sure it takes as wonderful as it looks. Great post! This is such a beautiful dessert! I am in love.